The pleated plaid miniskirt will do it every time. Yup. Another "viral" spoof featuring hot girls in pleated plain miniskirts. This time the ladies are spoofing the Tiger woods Hackey Sack commercial. What else is there to say really? We missed this one last week. 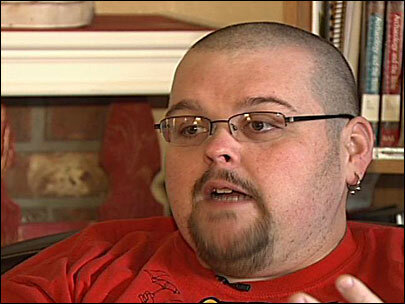 Springfield Oregon man, Aaron Jamison was diagnosed with colon cancer a year ago and has recently been given three months to live. As a means to cover the cost of his cremation and avoid leaving his wife with the bill, Jamison sold ad space on the three urns in which his ashes will be placed, joking, "I'm 400 pounds, so there's enough ashes to go around." Sixteen companies have paid for space with PETA being the last. One PETA ad will read, "People who buy purebred dogs really burn me up. Always adopt." Another from PETA will read, "I've kicked the bucket - have you? Boycott KFC." 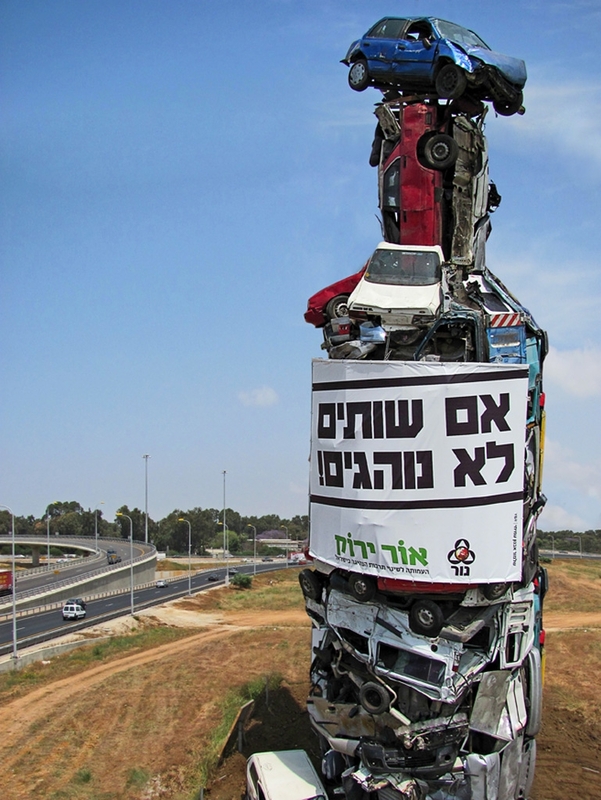 How do they get people to understand the dangers of drunk driving in Israel? 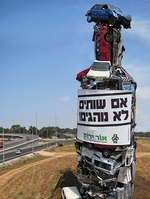 They gather together 80 cars that were totaled in accidents, use them to construct a 20 meter tall object in the shape of a bottle and then place the thing alongside the road with a simple message: don't drink and drive. Shalmor Avnon Amichay/ Y&R Interactive Tel Aviv created. 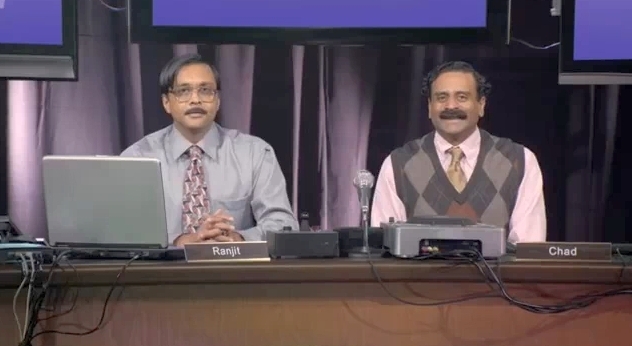 Over at Ad Age, Bill Imada is taking a beating over his comments on a MetroPCS campaign which features two Indian talk show hosts, Ranjit and chad, hyping the benefits of MetroPCS. Imada claims the commercial resorts to ethnic stereotyping. Almost every single commenter disagrees with Imada's assessment. We don't have much to add but urge you to ask yourself this question, When you last called a company regarding a technical support issue, who answered the phone and what did they sound like? While the ad is, indeed, over the top, it's a reflection of reality, a key quality of good advertising. Elle McPherson did it to sell her lingerie. Now Marissa Lingerie is doing it. Doing what, you ask? Holes. Yes, holes. No, not holes in their underwear...though given the see-through nature of most lingerie, holes do play a role in lingerie. Rather we're talking about a different kind of hole here. While McPherson offered up a keyhole to pseudo masturbation, Marissa created a...construction hole. Yes. A hole through which passersby can peer and watch lingerie-clad construction workers do their thing. And many a passerby took the time to gander at the hotness within. If you appreciate the skill of digitally removing stunt gear, you'll love this new Lipton Yellow Label commercial from DDB Paris and Biscuit Filmworks. And if you appreciate the process of scoring a popular orchestral piece such as Lalo Schifrin's Mission Impossible theme, then you'll love this visualization of the creative process. Or if you just love the notion of people being controlled as if they were puppets, you'll love this commercial as well.